The key to becoming a respected artist is not necessarily to do something entirely new and different, but to do it in a compelling way. Belgian artist Wim Delvoye is certainly not the first artist to ever carve old tires into new works of art, but he does it so masterfully that his pieces are unforgettable. Wim Delvoye has got to be a very patient man to do what he does. 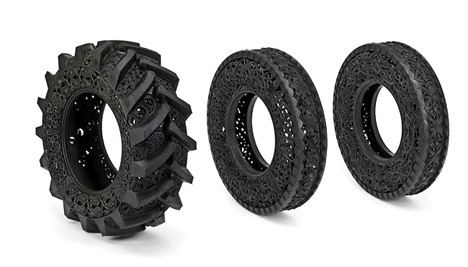 The tires he works with are regular, thick, tough vehicle (and sometimes tractor) tires, yet the intricate designs he gives them would suggest he is working with a much softer material. The lines are precise and perfectly placed, each leaf and petal and vine divinely shaped, and the symmetry wonderfully formed. Delvoye carves every tire by hand with no machines involved. 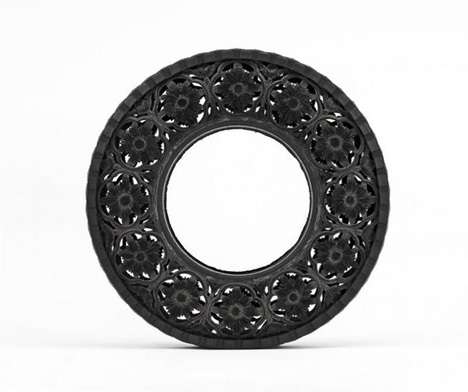 Each tire looks a bit like a fancy decoration, sort of like lace made of rubber. The delicate beauty of the carvings seems oddly at home with the rough industrial material into which they are carved.